Who better than Dr. Seuss to remind us how lucky we truly are, even when we’re down in the dumps? THE MORAL OF THE STORY: Focus on what you have and don’t dwell on the bad. This Yiddish folktale depicts gratitude in an uproarious light. When an unfortunate man follows the advice from his Rabbi, his life seems to go from bad to worse – or does it? THE MORAL OF THE STORY: Things are not always as bad as they seem. Sylvester the donkey is thrilled to have found a magic pebble! But when he encounters a lion on his way home, he must make a decision that separates him from his family. When he’s finally reunited with them, he learns a valuable lesson. THE MORAL OF THE STORY: Always be grateful for family. Billy Babble is the richest Babble in Babbleland. He begins to feel like something is missing and sets out on a quest to fill his empty heart. THE MORAL OF THE STORY: A grateful heart is a happy heart. Filled with whimsical illustrations and quirky characters, this book notes all the things in life to be grateful for. The list spans from simple joys – tree, trains, a nice breeze and rain – to the extraordinary – skipping jungle cats and alligator acrobats. THE MORAL OF THE STORY: We have so many reasons to give thanks. A classic by Shel Silverstein, this tender story is that of a boy who learns a lesson about the gift of giving – but only after it’s too late. THE MORAL OF THE STORY: Generosity should be appreciated and returned. The Mine-O-Saur is always snatching up all the toys, grabbing all the snacks and hoarding all the blocks, yelling “mine, mine, mine!” When will he learn the secret to making friends? THE MORAL OF THE STORY: Sharing is caring. The generous Quiltmaker spends all of her time making quilts only to give them away. When she’s approached by the greedy king to make him a quilt, she agrees, but only under certain conditions. THE MORAL OF THE STORY: Giving is the true secret to happiness. This is the true story of a mother who gives a little money to her son, Kojo, after receiving a loan from some village families. With this tiny loan, Kojo buys a hen that grows to a large flock and then an entire farm. THE MORAL OF THE STORY: Giving even a little can make a big difference. After their home is destroyed by a fire, Rosa, her mother, and grandmother save their coins in hopes of buying a comfortable chair that her hard-working mother deserves. THE MORAL OF THE STORY: Generosity is important in hard times. A Chinese emperor holds a contest where the child who grows the most beautiful flowers from his seeds will be his successor. On the final day, it appears many children have won the contest, but there is only one true winner. THE MORAL OF THE STORY: Honesty is the best policy. David always has a good excuse ready whenever he gets in trouble for his mischievous antics. Slowly, David realizes that making excuses makes him feel bad, and saying he’s sorry makes him feel better. THE MORAL OF THE STORY: It’s better to own up to your mistakes. Fannie Fudwupper’s big brother, Edwurd, spends his time cooking up giant lies. But one day, Edwurd tells such a whopping lie that the army, the air force, and the dogcatcher are called to reverse the damage. THE MORAL OF THE STORY: Stick with the truth. Sam is so eager to make friends at his new school that he tells them a story that isn’t true. But when the truth comes out, Sam realizes the difference between telling a story and spinning a tale. THE MORAL OF THE STORY: Your true self is your best self. When Brother and Sister Bear accidentally break Mama’s favorite lamp, their little lie about how it happened grows bigger and bigger. Thankfully, Papa Bear helps them find the words that set everything right again. THE MORAL OF THE STORY: You’ll always feel proud about telling the truth when the time comes. This colorful picture book contains endearing examples and vibrant illustrations of people doing good to inspire children to be grateful, caring, and kind. Be it the people that build houses, deliver babies, or take care of others, the message is that people are good. THE MORAL OF THE STORY: Kindness is always appreciated. This fun book explores life from an ant’s perspective, when an ant strikes up a conversation with the boy who’s about to step on him. THE MORAL OF THE STORY: Kindness should extend to all living creatures. New girl, Maya, comes to school and tries to befriend Chloe, but Chloe continually rejects Maya’s attempts at friendship. After Ms. Albert teaches a lesson about kindness, Chloe realizes she has been cruel to Maya. But Maya’s family has moved away, and Chloe is left feeling that she will never have a chance to show Maya kindness. THE MORAL OF THE STORY: You never know how far even a little bit of kindness can go. Amos McGee, the zookeeper, makes sure to spend a little bit of time with each of his animal friends each day at the zoo. When Amos is too sick to go to work, his animal friends come to him to return the favor. THE MORAL OF THE STORY: Be kind to others and they will be kind to you. 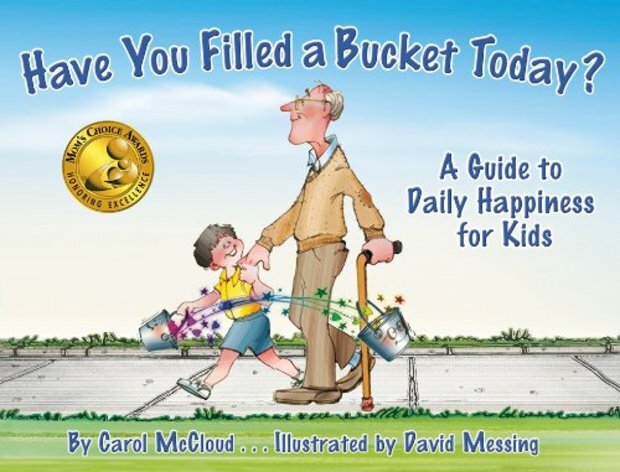 This award-winning book is based on a beautiful metaphor – that everyone has an invisible bucket that be either be filled or dipped into. Helping others and being kind feels the bucket, while the opposite empties it out. THE MORAL OF THE STORY: Helping others and being kind brings happiness to yourself and others. This entry was posted on September 9, 2015 at 8:40 pm and is filed under Literacy. You can follow any responses to this entry through the RSS 2.0 feed. You can leave a response, or trackback from your own site. This is an amazing overview!!! Thanks so much – I’m going to definitely pass this list along to my adult students. And I have to buy that Dr. Seuss book – never heard of it before – wonderful! No problems. Thanks for the feedback!